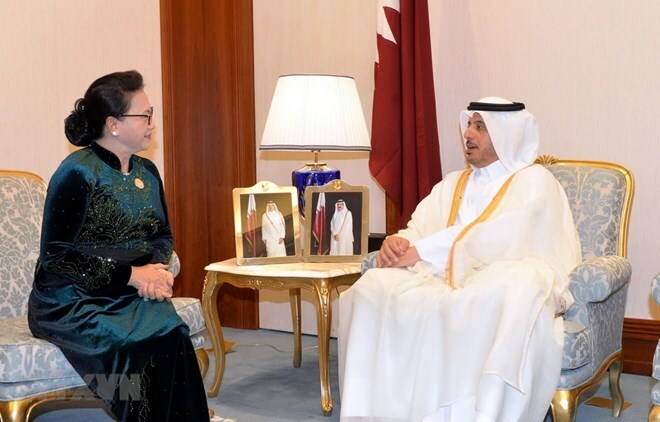 Doha (VNA) – Vietnam treasures ties with Qatar, considering the country an important partner in the region, National Assembly Chairwoman Nguyen Thi Kim Ngan said. Ngan informed the host about Vietnam’s recent situation, saying that its economy grew by 7.08 percent last year and the country signed and enforced 12 free trade agreements (FTAs) and is in the processing of negotiating four other FTAs. Vietnam also recently hosted the second summit between the USA and the DPRK. Recalling Qatar Airways’ launch of direct flights to Hanoi and the central city of Da Nang in 2018, the leader stressed that Vietnam wants to continue partnering with Qatar in the fields of trade, investment and tourism. She also hoped that the Qatar PM will create favourable conditions for Vietnamese firms.